Exploring Mi’kmaq Culture at Gretna Green School – The Next 150 Challenge. Miramichi Relay for Life – Register a Team! Events, classifieds, submitted photos, and more! The cover photo on the spring issue of Giv’er Miramichi magazine was taken by Jeff Pendlebury and shows boats participating in the Miramichi Stiper Cup with Ritchie Wharf in the background. The inset photo is of Susan Daigle of St. Charles, NB with the “bad boy” she caught near Strawberry Marsh, Miramichi. Visit www.giverontheriver.com where you’ll always find good news, and positive, uplifting stories in our blog posts. Send us your good stuff to talk about on the river! We’re looking for events, stories, celebrations and pictures about what’s up, what’s new, and what’s happening. Keep it positive and we’ll promote it. 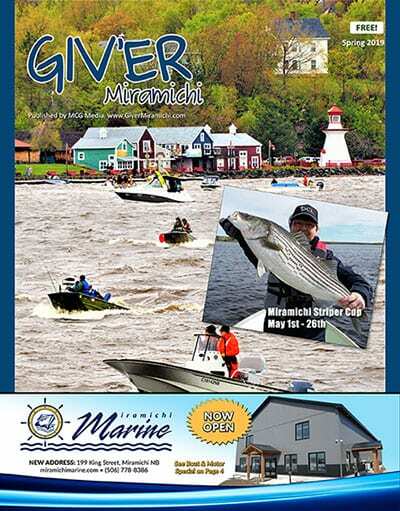 Giv’er Miramichi is published and copyrighted by MCG Media in Miramichi.